Sulochana Thapar Foundation is reaching out to people living with HIV through its Antiretroviral Therapy and Continuum of Care initiatives. The Antiretroviral Therapy and Continuum of Care project by Sulochana Thapar Foundation has changed the lives of thousands of people living with HIV. Implemented in collaboration with the National AIDS Control Organization, this Public-Private Partnership model has successfully reached out to more than 3,300 people living with HIV in the Indian states of Odisha and Maharashtra. Majority of the patients reached by the Foundation are poor and have limited access to resources. The project’s uniqueness lies in the holistic package of clinical and outreach services offered to patients. In addition to counselling, antiretroviral drugs and treatment for opportunistic infections, the package offers innovative solutions for addressing patients’ special needs for home-based care, enhanced nutrition, improved hygiene and a host of other social and livelihood services as part of continuum of care. Antiretroviral Therapy centers are run by the Foundation in partnership with the National AIDS Control Organization in Ballarpur, Maharashtra and Koraput, Odisha. 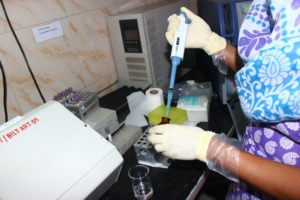 These centers are equipped with state-of-the-art laboratories conducting CD4 tests, haemogram and bio-chemistry analyses with the required accuracy and precision. Adequate staff is positioned by the Foundation whose technical training and capacity development provided by the National AIDS Control Organization. These centers have reached out to people living with HIV in several remote villages of adjoining districts. People living with HIV and their families have emotional, social, physical and spiritual needs that change over time. They often have to cope with the effects of stigma and discrimination, poverty, loss of employment, neglect and abandonment. The purpose of the Continuum of Care project is to address HIV as a chronic disease and develop systems that provide humane, effective, high quality, comprehensive and continuous care to people living with HIV and their families. Continuum of care services are provided to people living with HIV at their homes or in communities and health facilities close to them. The project provides comprehensive support to people living with HIV and their families focusing on home based care. Although services like inpatient facilities are typically not part of continuum of care, Sulochana Thapar Foundation coordinates with other agencies to provide such services to people living with HIV. The Foundation’s continuum of care model promotes and sustains a holistic approach to care and support for people living with HIV. The project places people living with HIV at the centre of a wide range of actors who are dynamically linked. The entry point to the continuum is integrated counselling and testing for HIV. Home based care is an important element of this broad system of care provision. This is particularly relevant and critical when reaching out to patients from economically disadvantaged families.